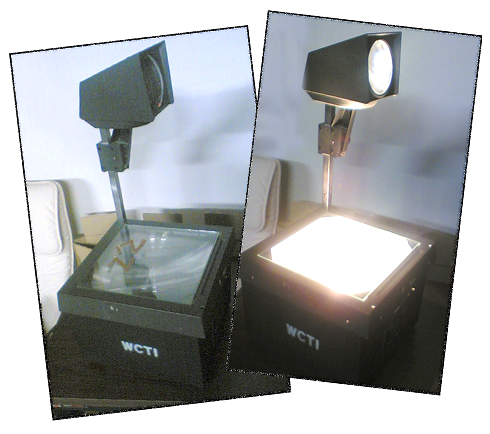 I picked up an old overhead projector from WCTC during one of their auctions of old equipment. For those of you who attended elementary school 20 or more years ago, you may remember these things. They were used by teachers in classrooms before PowerPoint existed. It’s old-tech, but still cool. This one is a pre-1988 model, but since it says “WCTI” I’m guessing it’s even older, and it still works fine. When you did a presentation on one of these you didn’t have to worry about VGA adapters, resolution, or file formats. Of course, you did have to worry about the bulb burning out.